Process Combustion Corporation's Flameless Thermal Oxidizer (FTO) systems are the best solution for applications that require the highest Destruction Removal Efficiencies (DRE) and lowest NOx emissions. Each FTO is fully automated and engineered to accept the full range of waste gas compositions and flow rates generated by our customer's manufacturing process. How do we achieve such low NOx? A typical burner system can have hot spots within its flame that exceeds 3000°F. High flame temperatures, even for short residence times (msec), can cause large amounts of Thermal NOx to be generated. PCC's Flameless Thermal Oxidizer premixes waste gas with air and natural gas prior to treatment. The FTO's operating temperature is lower and more uniform throughout the media bed which leads to NOx generation as low as 1 ppmv. In a global economy with a number of potential control technologies to choose from, it is important for companies to understand their options. It is also important to recognize that environmental regulations can only get more stringent in the future. 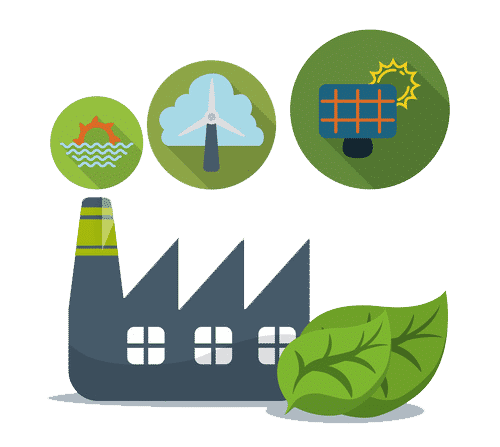 Forward-thinking companies with a strong sense of corporate social responsibility want the best available control technology (BACT) at their manufacturing facilities. The PCC FTO achieves 50x less NOx than the Industry Standard Burner! How do we achieve 99.9999% DRE? A PCC Flameless Thermal Oxidizer perfectly mixes waste gas, air, and fuel gas. This allows excess oxygen to more successfully find and react with organic material in the gas mixture once preheated to each compounds auto-ignition temperature. The flow through a PCC Flameless Thermal Oxidizer involves multiple seconds of residence time at high temperatures. Because perfect mixing has already been achieved, high gas velocities are not required. As a result, the flow through each unit can be slower leading to longer retention times for oxidation reactions to reach completion. Each PCC Flameless Thermal Oxidizer operates with a completely uniform temperature profile that means the entire gas flow passes through a bed with a constant temperature profile to ensure that optimum destruction is achieved. In a global economy with a number of potential control technologies to choose from, it is important for companies to understand their options. It is also important to recognize that environmental regulations can only get more stringent in the future. Forward-thinking companies with a strong sense of corporate social responsibility want the best available control technology (BACT) at their manufacturing facilities. The figures shown below compare the performance of common control technologies for gaseous waste streams with PCC's Flameless Thermal Oxidizer. Flameless oxidation is a thermal treatment that premixes waste gas, ambient air, and auxiliary fuel prior to passing the gaseous mixture through a preheated inert ceramic media bed. Through the transfer of heat from the media to the gaseous mixture, the organic compounds in the gas are oxidized to innocuous by-products, i.e., carbon dioxide (CO2) and water vapor (H2) while also releasing heat into the ceramic media bed. PCC’s Flameless Thermal Oxidizers are designed to operate safely and reliably below the composite LFL while also maintaining a constant system flow and temperature. Waste gas streams experience multiple seconds of residence time at high temperatures leading to measured destruction removal efficiencies that exceed 99.9999%. Premixing all of the gases prior to treatment eliminates localized high temperatures which leads to thermal NOx as low as 1 ppmv. 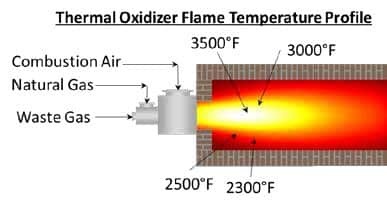 Why use a flameless oxidizer? In a global economy with a number of potential control technologies to choose from, it is important for companies to understand their options. It is also important to recognize that environmental regulations can only get more stringent in the future. Forward-thinking companies with a strong sense of corporate social responsibility want the best available control technology (BACT) at their manufacturing facilities. Flameless Oxidation has proven to be the best control technology for the Pharmaceutical and Specialty Chemical Industries because of each systems reliability and high emission performance. 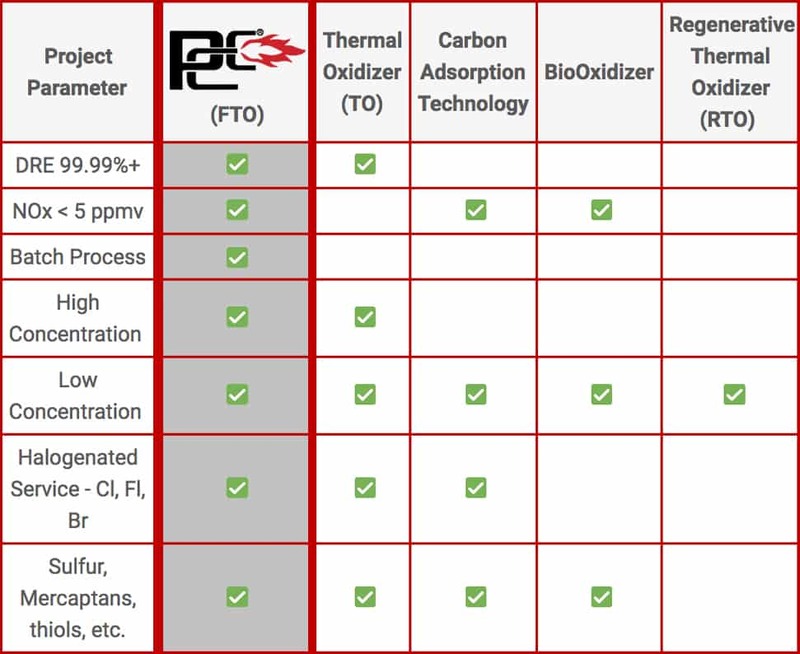 The figures shown below compare the performance of common control technologies for gaseous waste streams with PCC’s Flameless Thermal Oxidizer. What are PCC's Flameless Thermal Oxidizer (FTO) Models? The electric model consists of a vertical refractory lined vessel filled with ceramic media. Ceramic media is preheated through the use of electric resistance heaters. Waste gas and ambient air are premixed at the bottom of the unit and introduced into the unit. Organic compounds in waste gas are oxidized and discharged to atmosphere via a stack extension on the top of the vessel. The Planar model is a refractory lined inverted cone vessel filled with ceramic media. Ceramic media is preheated through the use of a small auxiliary natural gas burner. Waste gas, ambient air, and natural gas enter the bottom of the vessel through a gas distributor plate. 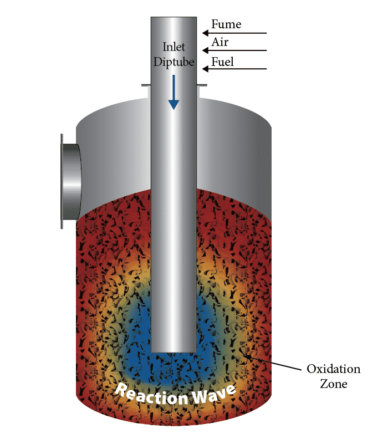 Heat is generated via the oxidation of natural gas and waste gas. The Elliptical model is a refractory lined cylinder partially filled with ceramic media. Ceramic media is preheated through the use of an auxiliary natural gas burner. Waste gas, ambient air, and natural gas are premixed at the top of the vessel and delivered to media bed through use of a central dip-pipe. What are the advantages to PCC's Flameless Thermal Oxidizer (FTO) Models? Destruction Removal Efficiencies greater than 99.9999%. NOx emissions of less than 1 ppmv. Ceramic media bed is stable and resilient to temperature fluctuations. Sets the bar for BACT requirements for gaseous waste streams. Waste stream feed forward control ensures stability and prevents nuisance shutdowns. How does PCC achieve such a low NOx? How does PCC achieve a 99.999% DRE? PCC's Flameless Thermal Oxidizer achieves all three of these metrics by design. temperatures. Because perfect mixing has already been achieved, high gas velocities are not required. As a result, the flow through each unit can be slower leading to longer retention times for oxidation reactions to reach completion. With more than 1,000 systems successfully operating throughout the world, we’ve custom designed systems for many Fortune 500 companies ranging from $150,000 to more than $15 million. PCC has experience working with many systems. With installations successfully operating in over 35 countries, PCC has the knowledge and experience to integrate a new system with your current operating platform. PCC's Quality Management System is certified in conformance with the ISO 9001:2015 standard. PCC's adherence to consistent and predictable systems is a cornerstone of our long-term track record of success.